Seek shelter inside a sturdy building. In the event of a tornado, the safest place is on the lowest level. Choose a small room with no windows, such as an interior closet, hallway or bathroom. Charge cell phones, pagers and other electronic devices. Have several flashlights with extra batteries on hand, as well as a first-aid kit. Have on hand a three-day minimum supply of water – one gallon per person per day, plus three days’ supply of food and drink that does not have to be refrigerated. Use a battery-operated weather radio to stay informed. Turn down the thermostat to cool your house. If you keep doors and windows closed after the storm, you can keep your house relatively cool for about 48 hours. Be prepared to disconnect or shut off any appliances that will turn on automatically when power is restored, including electric space heaters and stoves, washers, dryers, TVs, microwave ovens, computers, refrigerators and freezers. If not, when power is restored, several appliances may come back on at the same time and overload your circuits, or hot appliances may come on while you are away or asleep, posing a fire hazard. If power is out, call Alabama Power’s automated reporting system at 1-800-888-APCO (2726). It is the fastest way to report an outage or a hazardous situation, such as a downed power line. Stay away from downed lines. Do not drive over lines or under low-hanging lines. Keep children and pets away from downed lines. Do not attempt to remove tree limbs or anything else caught in power lines. Call Alabama Power at 1-800-888-APCO (2726) or contact a local law enforcement agency if downed lines are spotted. Stay clear of areas with fallen trees or debris where downed lines may be hidden. Debris or downed trees could conceal an energized line. Do not attempt to repair the electrical system or pull tree limbs off lines. Let our trained work crews perform this potentially dangerous work. Stay away from areas where repair crews are working. Alabama Power gives priority to hospitals, water and sewer treatment facilities, police, fire and other critical customers for the overall safety and well-being of the community at large. Individuals with critical medical needs should consider making contingency plans in case of outages. Read and follow carefully the manufacturer’s instructions before using a generator. Do not plug in portable generators to your household wiring. This can cause serious injury to you and to Alabama Power employees working on the lines in your neighborhood. Connect only essential appliances – such as freezers and refrigerators – directly to the generator. To avoid carbon monoxide poisoning, operate generators outdoors in a well-ventilated, dry area that is away from air intakes to the home, including window air conditioners. A good location is an open shed. Never use a portable generator indoors or in attached garages. 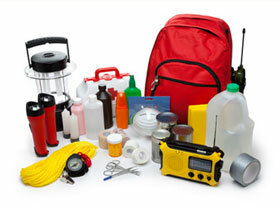 Click here to view the Emergency Supply Kit. Learn how Alabama Power restores services after a major weather event. Store enough storm supplies to get each family member through three days without electricity or running water.